Recently added to my collection, but I am raising funds for the perfect Pre-Moon, which has now crossed my path. Therefore, unfortunately I have to let this one go. The watch is in stunning and original condition. The case appears to be unpolished, with its sharp edges still intact. Crown and pushers appear to be the original ones as well. The beautiful Salmon Dial has a lovely, light patina to it. The hands appear to be original as well, as the patina on it looks consistent with the rest of the watch. The movement keeps time well. It has been serviced in the past, however I don't have an exact date. The case measures 37mm excluding crown. Lugwidt is 18mm. Pricewise, I would like to get €3k for this rare piece. Insured shipping included, wherever you are located. 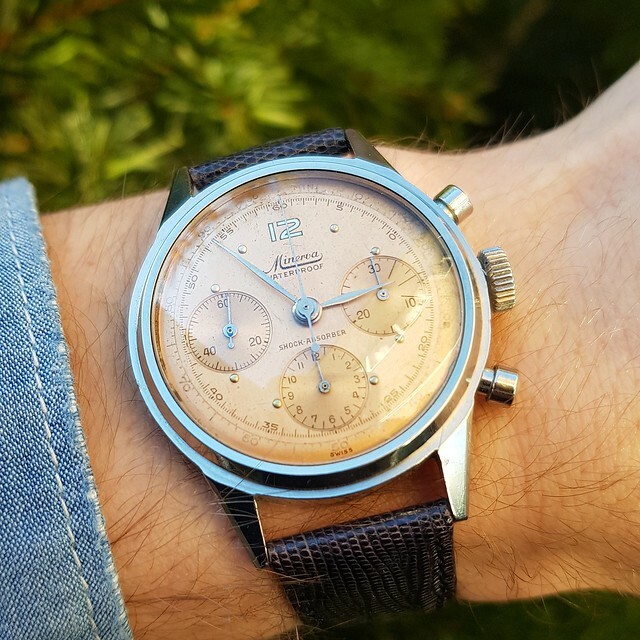 I have dozens of references on watchforums, Instagram and Facebook. My Instagram page is: Watchcollectorfromholland.